Editors Note: Another guest contribution from valknut79 to The Prepper Journal. As always, if you have information for Preppers that you would like to share and be entered into the Prepper Writing Contest with a chance to win one of three Amazon Gift Cards with the top prize being a $300 card to purchase your own prepping supplies, then enter today! Composting is a natural, effective way of improving your soil quality – a must for any preppers who plan on doing any kind of gardening. As it stands, it’s possible to hit your local hardware store for a few bags of compost that you can integrate into your soil to help improve it, but post-collapse, this “black gold” of gardening is going to be in demand if you plan on creating bountiful crops. In addition, compost is also a highly effective method of ridding yourself of garbage without relying on the local garbageman. Setting up a composting system is super simple, and is an easy project you could completely set up within two hour’s time. Following through with your system is an ongoing process, but only slightly more complicated than separating your garbage between regular and recycling piles. 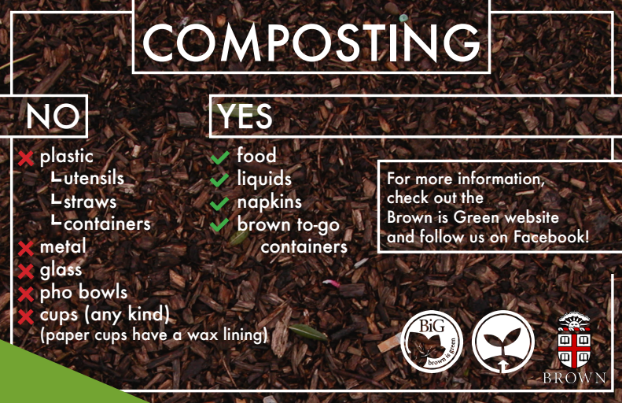 Compost is, essentially, decomposing plant material. When you toss out your leftover lettuce stumps, carrot heads, or onion skins, you’re wasting valuable compost material – simply burying or speed-composting this leftover vegetable mess could take all of the beneficial nutrients that are stored in the food and gift them back into the soil, to be pulled out in next year’s radish or broccoli crop. The plants that you grow must take their nutrition from the soil around them. If your soil has been drained of nutrient resources, your crops may struggle to take root and get off the ground. Compost is part of the magic that keeps our natural life cycle running by taking the leftovers you wouldn’t use anyways and putting their nutrients back into the system. 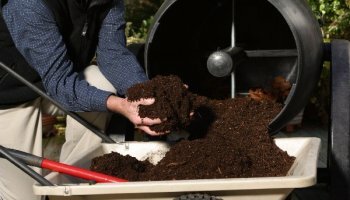 Compost looks and acts just like a regular soil – it’s simply a little denser than normal soil, and a lot healthier than a chemical supplement like Miracle Gro. At our house we have a variety of composting areas, because over the course of the year, we create a lot of vegetable garbage. When cooking, we dispose of our leftover pieces – the greens of cauliflower, the tough ends of asparagus, and the rinds of watermelons – and we put them in a bowl to be placed in a composter at some point later in the evening or the next day. Once the garbage is disposed of, you just need to wait for nature to take it’s course. Some gardeners simply pile their compost in an area that’s outside of view, but I think that this is not the ideal method. Depending on how fastidious you are about what you put in the pile and how well you hide or cover the material, it may attract bugs or animal visitors that you don’t want anywhere near your home. Even tied-up or bound compost piles create some danger of this, and it’s slow. Because it’s open to the air, you may have to wait a year or more to access your compost. The simplest method that I can recommend is using a compost bin. Ours is a round black trash can with hinge and a locking mechanism on the lid. I drilled holes in the top and bottom of the can to promote air flow, and as it starts to fill, I tip the can over and roll it around on the lawn to aerate the contents. 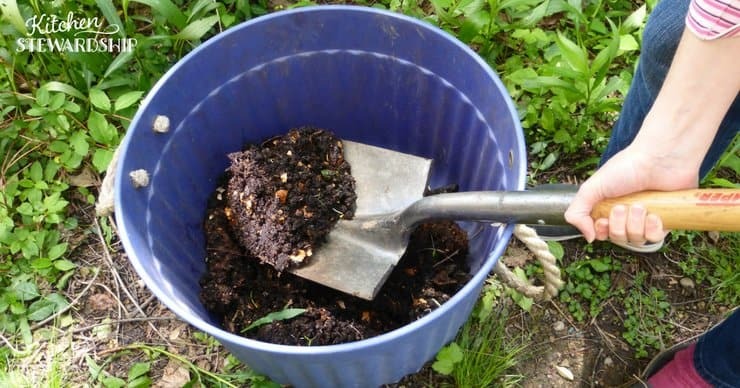 If the bin is filled with the right mixture of fast-decomposing plant material (see later in this article) we can have compost ready in as little as two to three weeks, although in most cases it takes a month or more. Nothing has yet broken into my mobile bins, and I use two or three at a time to create a balance of rotting and readiness times. 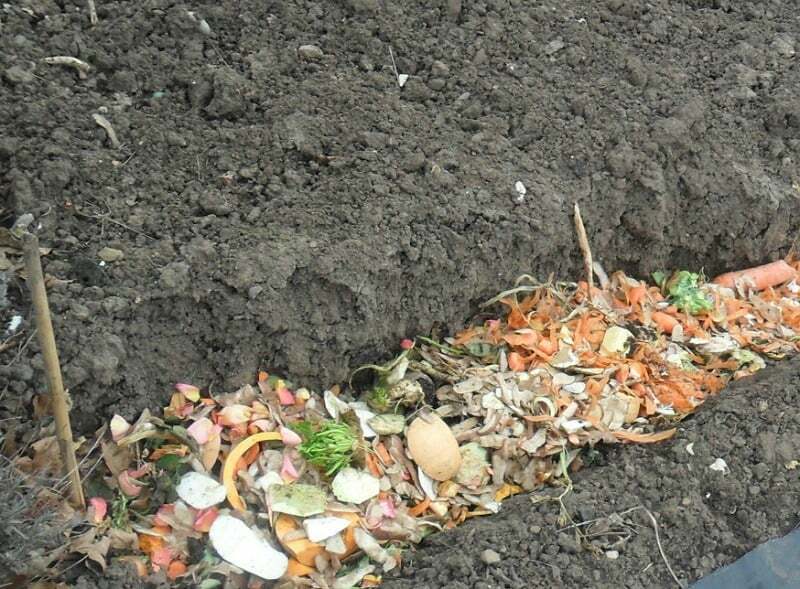 Another very simple method to create compost is to use the trench method. This is pretty much exactly what sounds like – a shallow and narrow trench running through your garden where you place your composting material, then burying it as you fill it. If you do a lot of non-vegetable plant waste (i.e. grass clippings, wood, etc), then this is a great way to improve your soil quality. Some vegetables will sprout if you bury them, so you may end up with a few eggplant or pepper plants popping up if you compost these remains. If you have particularly large things to compost – fallen trees, logs, etc. – then a hill compost may be best. Line up the material you wish to rid yourself of, wet it thoroughly, and pile dirt or sand on top. In as soon as four to five years, you should have the material completely broken down, and have a rich pile of soil just waiting to be transplanted into your growing areas. Compost can be created using almost anything “natural” as well as many everyday products, like boxes from Amazon, coffee cups from many local establishments, cigars or bread and pasta products. The best mix, in my opinion, is a widely varied group of materials, but certainly, there are composting superstars. I like to call them “breakfast compost” – coffee grounds, egg shells and banana peels are three highly nutritional ingredients that can help to improve your plant’s conditions. Generally speaking, the thicker and larger pieces you put in your composter, like straw, sticks, boards, root vegetables or cardboard boxes, will be slow decomposers. They have some nutritional benefit, but if not chopped or broken down before being added, it could be a while before they rot to the point that they make nice smooth consistency compost. Things which break down particularly quickly are grass clippings, ash, tea bags, bread, weeds, and dead plant material. Fallen leaves from your trees fall somewhere in the middle – occasionally they break down quickly, and at other times they take their time. 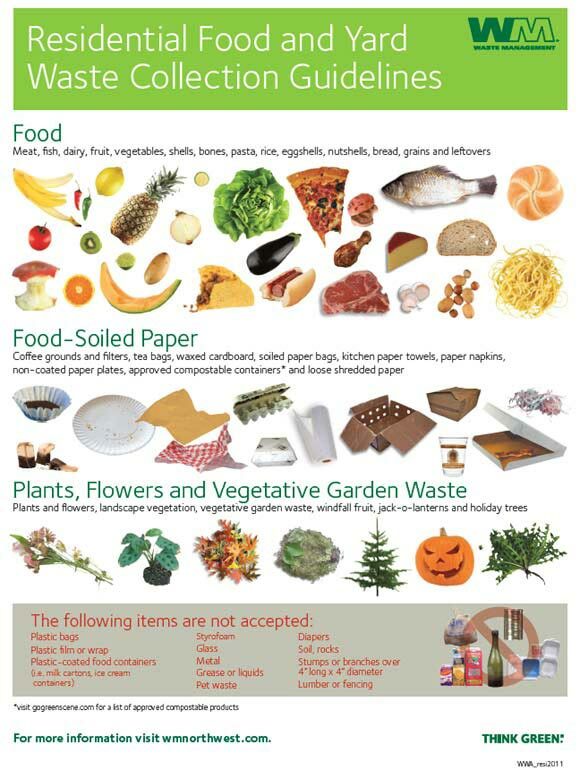 Do not add meats, dairy products, or animal feces to your compost mix. They’ll break down, certainly, but they smell, and can attract many animals. I’ve also seen people recommend staying away from composting citrus fruits and onions, stating that while they decompose, they can potentially harm some of the beneficial bacteria that you’re harvesting in your compost, and slow down the rotting process. I have not had detrimental effects, but as I do not use these products to great excess, I can’t say that I’ve added too many of either to my composter. A few never hurts. 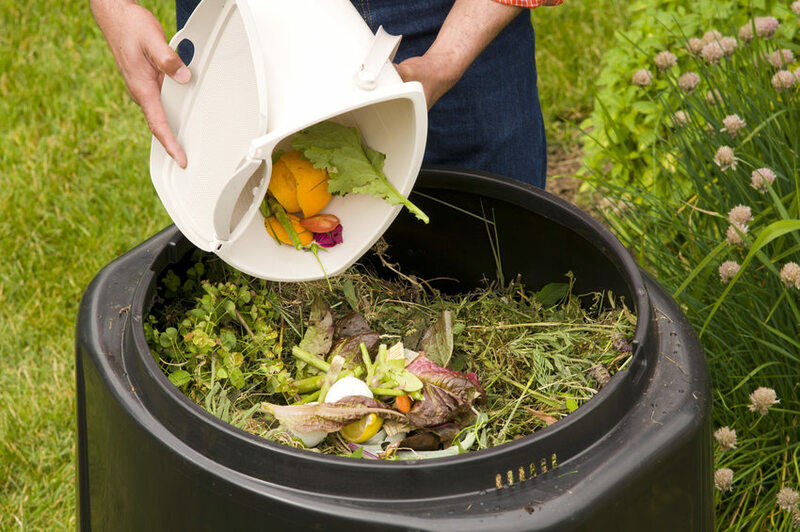 With weeds and fruit parts, it is particularly important that you put them into a sealed composter bin. Both contain seeds, or at least, the impetus to spread. Planting either into a trench or pit composter may simply mean that you’ve moved them from one area to your garden into an area where they can propagate more quickly and prolifically. 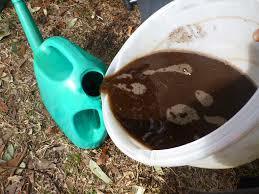 The high heat created by the rotting materials within a sealed composter will kill off any ability for these plants to grow, and will instead break the materials down. Compost is a must-have. We use it as the basis for most of the soil mixture in our gardens, mixing it into the topsoil or commercial mixture because of it’s high nutrient content. We also use it as a soil amendment if we have a group of flowers or veggies that are not growing to their potential. 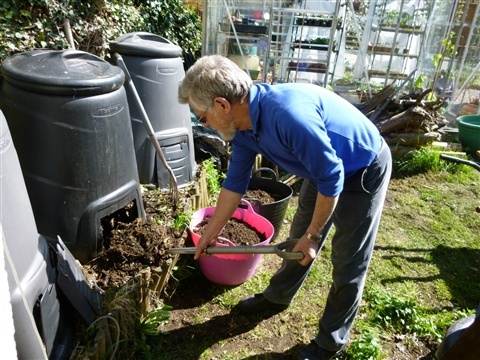 Simply mound up a handful of compost around the plants which need a boost, and usually after a few watering’, they’ll perk up as the nutrients seep from the compost into the soil and root systems below. 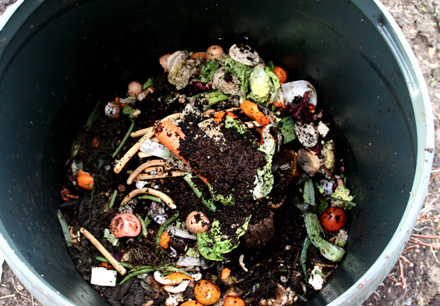 A composting system set up takes two hours or less for the vast majority of people, and is an effective way to not only help out your garden, but deal with garbage and reduce the waste you create. What are you waiting for? Go get those trash cans! The post Simple Summer Project – Composting appeared first on The Prepper Journal.